Instead of lazing in Central Park’s Sheep Meadow or Great Lawn, you now have the option to head south for eclectic art, food events, and even a sandy beach at this former military base off the tip of lower Manhattan. For circus geeks, there are flying trapeze lessons on the weekends; others rock out to awesome waterfront concerts from the likes of M.I.A. and Passion Pit. 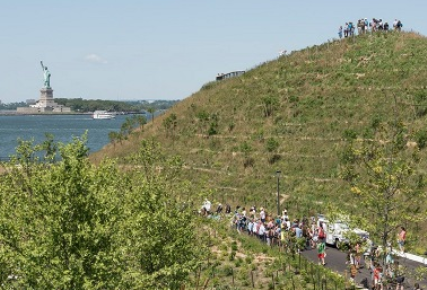 Getting to Governors Island has its own appeal: the free ferry ride from Manhattan’s Battery Maritime Building or Brooklyn Bridge Park’s Pier 6 offers panoramic views of the skyline and the Statue of Liberty. Coolest Time to Visit: Fridays from late May through early October, when hour-long bike rentals are free (normally $15 for adults). The island has a car-free policy, so cyclists rule the roads. The northwest corner, dubbed Millennium Park, made headlines when it opened in 2004 with the Frank Gehry–designed Jay Pritzker Pavilion and Anish Kapoor’s stainless-steel Cloud Gate—the shiny, reflective bean-shaped sculpture that’s become an instant city icon and popular photo-op. Compare the outdoor installations to the collections within the park’s Art Institute of Chicago, famous for Grant Wood’s American Gothic. Coolest Time to Visit: Summer, when the lakefront park hosts two major events: Taste of Chicago, the world’s largest outdoor food festival, with treats from 70-plus local restaurants, and Lollapalooza, which celebrates its 20th anniversary in August 2011. Orange-red sandstone geological rock formations like Hole-in-the-Rock have been a fixture of this 1,200-acre park for millennia. The Desert Botanical Garden, a more recent addition, nurtures cacti, succulents, and other desert plants—amid a rotating collection of modern art that has ranged from steel sculptures by Ludvic to a 17-piece glass installation by Dale Chihuly. The park is also home to the Phoenix Zoo, which opened a new exhibit for its orangutan family in April 2011. Coolest Time to Visit: Sunset, when the sandstone buttes take on a deeper, more fantastic color. Arrive before 7 p.m., when entrances close (trails remain open until 11 p.m.). While the city skyline is visible from Hole-in-the-Rock, the most sweeping views are from South Mountain. Don’t forget your camera!